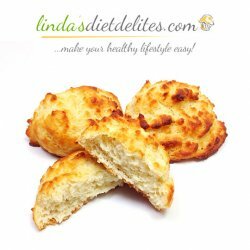 Our lowest calorie bagels with some sweetness! 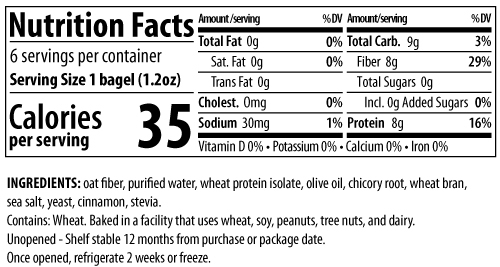 ThinSlim Foods Love-Your-Waist Cinnamon Bagels are a delicious and incredibly nutritious low calorie snack. Our revolutionary dough is not only low in calories and carbs, but also soft and fluffy. At 1g net carbs and only 35 calories per bagel, these are our most 'extreme' bagels. As a result they are very fibrous and a little dry. If you are the type of dieter who goes for items on the extreme end, they are definitely worth trying out. If you are looking for something closer to a traditional bagel we strongly suggest trying the ThinSlim Foods Love-The-Taste Bagels instead. 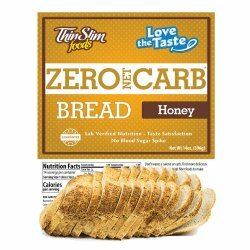 They are only 0g of net carbs and 90 calories. 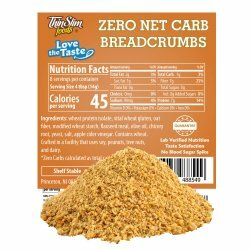 Ingredients: oat fiber, purified water, wheat protein isolate, olive oil, chicory root, wheat bran, sea salt, yeast, cinnamon, stevia.